Not a classic Grisham novel. I actually found this book very hard to get through. It felt like it plodded along. Very slowly and was quite hard to follow and find a rhythm. 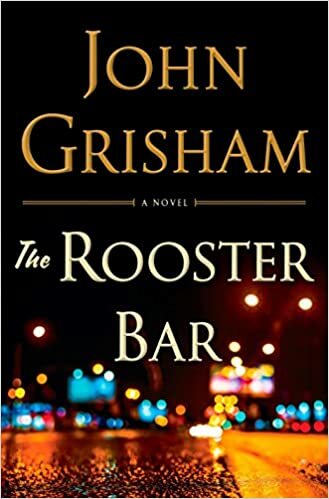 Ultimate,y I came to root for ten the trio of protagonists but not sure I would highly recommend this as Grisham has written so many more books that are far more enjoyable. Intriguing as are all Grisham books. It was not a story I could dream up myself but very believable. I would have liked a few closer calls in their escape but was very happy with the ending. This was a rollercoaster of a read for me. It hit close to home as I am a somewhat recent law grad, and all of the perils of the law job market and massive student loan debt is nothing new to me. It was reassuring to witness John Grisham tackle these issues and bring them to the forefront of his readers’ minds. Grisham also covered a multitude of other issues, including mental illness, the legal system and US immigration policy. The book covered these topics well, though at times, especially in the first half, it felt as if the reader was receiving the “kitchen sink.” A number of issues the US is facing are thrown into the book and at the reader, initially not seeming to have much to do with the plot. As the book progressed these outsider topics came together in a more coherent way. Other aspects of the plot, however, such as character development, weren’t quite what I had hoped. At times I lost track of two of the main characters, Mark and Todd. Their backgrounds and stories were so similar it was hard to remember who was the one with a brother and which one was from Philadelphia. It took me about halfway through the book to hit my stride, and in all honesty, it’s difficult to distinguish whether I purely enjoyed the book as a reader or as a lawyer and one-time law student who has shared similar experiences. Regardless, by the end of the book I was sold and would recommend it, especially to any lawyers or law students.